My recent article about Fighting Fantasy for the Times Literary Supplement contained a few quotes from Ian Livingstone. Along with Steve Jackson, Ian is the man who started Fighting Fantasy some 35 years ago, and he’s the author of a new book in the series, The Port of Peril, to mark that anniversary. He’s also behind some of the biggest developments in British gaming: Games Workshop, Tomb Raider… the list goes on and will, indeed, continue to go on. He’s even planning, as per this recent New Statesman article, to open a school. Anyway, those quotes in my TLS piece came from a conversation with Ian that I enjoyed in July. So that you can enjoy it too, I figured I’d publish a transcript of the parts where we talked about Fighting Fantasy. Here it is. Press on, brave adventurer, to hear about algorithmic thinking, rejection letters, and a potential return to Port Blacksand in future. PH: Fighting Fantasy returns in August with a new publisher and a new book. I know it’s the 35th anniversary, of course, but I still want to ask: why now? IL: Well, as you say, it’s the 35th anniversary. We celebrated the 25th anniversary with a hardback edition of The Warlock of Firetop Mountain. We celebrated the 30th anniversary with Blood of the Zombies. So, clearly, we had to celebrate the 35th anniversary with a new book! But, more importantly, we’ve seen a resurgence in the genre. People who enjoyed Fighting Fantasy back in the 1980s have now had their own children, and are passing the baton. Normally, children reject out-of-hand anything that their parents suggest could be cool or fun, but I’m delighted to say that Fighting Fantasy resonates with Generation Z in much the same way as it did with previous generations. These are books in which you, the reader, are the hero. They’re branching narratives with a game system attached. They allow children to make their own choices and decisions. Linear books are a passive experience, whereas Fighting Fantasy is an interactive experience giving control to the reader. Choice is empowering. Working out the optimal way through the books is algorithmic thinking in many ways. You mention algorithmic thinking. Does Fighting Fantasy reflect the experience of clicking around Google, for example? No. Fighting Fantasy is a game in book format where you’re trying to find the optimal way through the adventure with the least damage to yourself and the most treasure found. You’re trying to fulfil an objective to win through the book. There are all sorts of tricks and traps around; leading readers down what seems like a very safe route, only for them to fall on poison spikes. Designing them is great fun. And we put in anti-cheating devices. But, of course, we don’t mind if children cheat. It’s like peeking around the corner. I’ve been thinking and writing a bit about nostalgia recently. And then – whaddyaknow? – the world conspires to give me a massive hit of the stuff. It turns out that this year is the 35th anniversary of the Fighting Fantasy gamebook series, which was a huge part of my diet when I was younger. 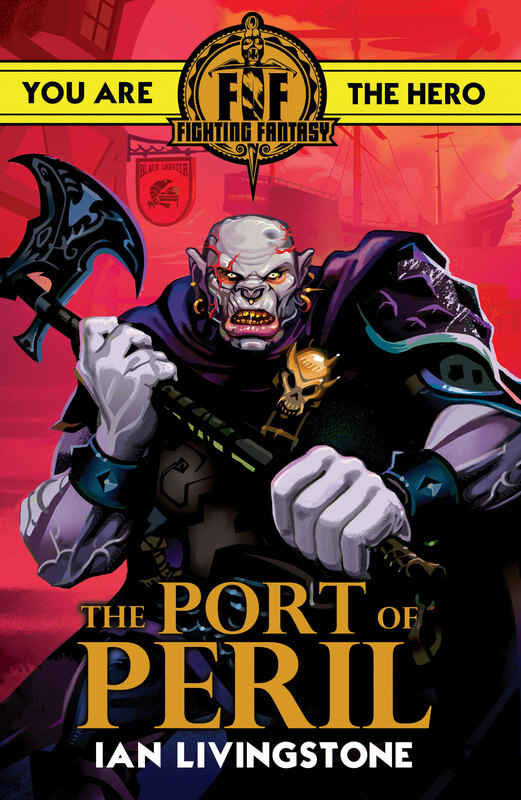 Not only that; one of the series’ founders, Ian Livingstone, has written a new book, The Port of Peril, to mark the occasion. I felt that old yearning to be the hero, all over again. Potted histories of gamebooks tend to mention, for example, B. F. Skinner’s investigations into linear programming, or the birth of the Oulipo group in 1960s France – and not without reason. After all, one of the principal texts of Oulipo, Raymond Queneau’s Cent mille milliards de poèmes, is a collection of ten sonnets that allows readers to interchange the lines, allowing for a hundred thousand billion combinations. Which is to say, you are the poet. There is also something Oulipian about the way in which Fighting Fantasy authors write within a set of self-imposed constraints. According to Livingstone, the main challenge is ensuring that all the winding paths don’t wind so much that they become closed loops, and that they reunite with each other when necessary. But there are also a hundred other considerations: ‘You’ve got to do the gameplay balancing, so that the monsters aren’t so tough that readers can’t get past them. You’ve got to make sure the economy is right, so there are enough gold coins, but not so many that readers can just buy their way through the adventure’. To which I would add: go buy some Fighting Fantasy books, whether for your kids or for yourself. Alongside The Port of Peril, Scholastic are republishing some of the classics – and they all show how a normal book, a collection of pages between two covers, can be turned into something strange and wonderful.